The Goat Island project allows the Mi’kmaq community to talk about their traditional practices, Lindsay stands in front of a teepee (photo: Nikki Bayley). 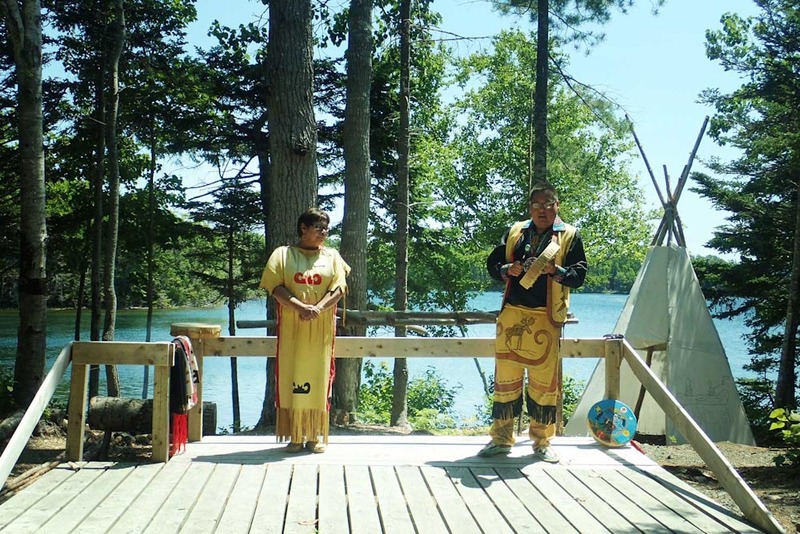 Germaine and Micheal share one of the community’s traditional songs in front of Bras d'Or Lake (photo: Nikki Bayley). 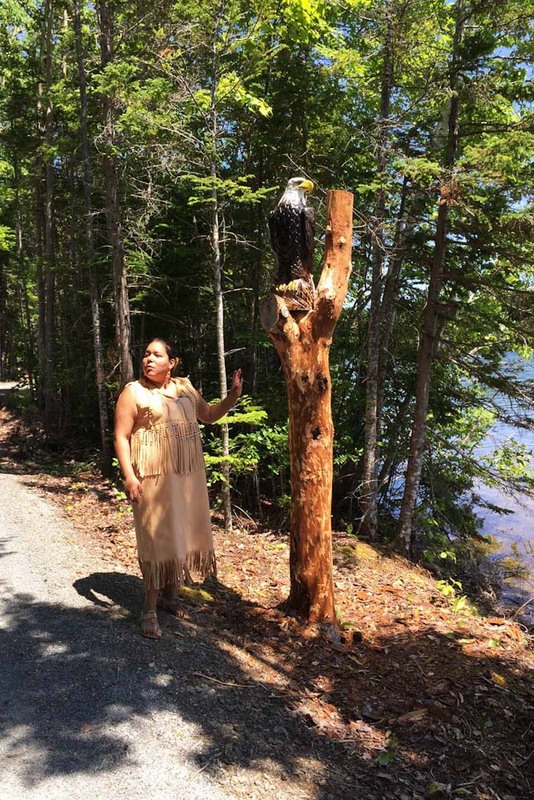 Giselle Stevens explains the significance of the eagle to Mi'kmaq nation, on Goat Island, Cape Breton (photo: Nikki Bayley). In Goat Island Forest, Lindsey Paul explains how the Mi’kmaq would sharpen their spears by heating them in the fire (photo: Nikki Bayley). 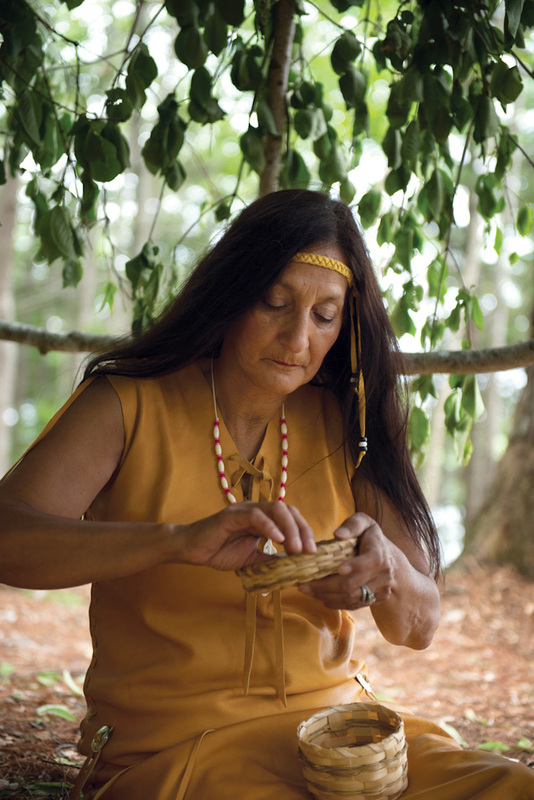 Mi’kmaq woman displays her traditional weaving skills on Goat Island, Cape Breton (photo: Scott Munn). Embark on a cultural journey with a First Nations guide on a secluded island in Cape Breton. 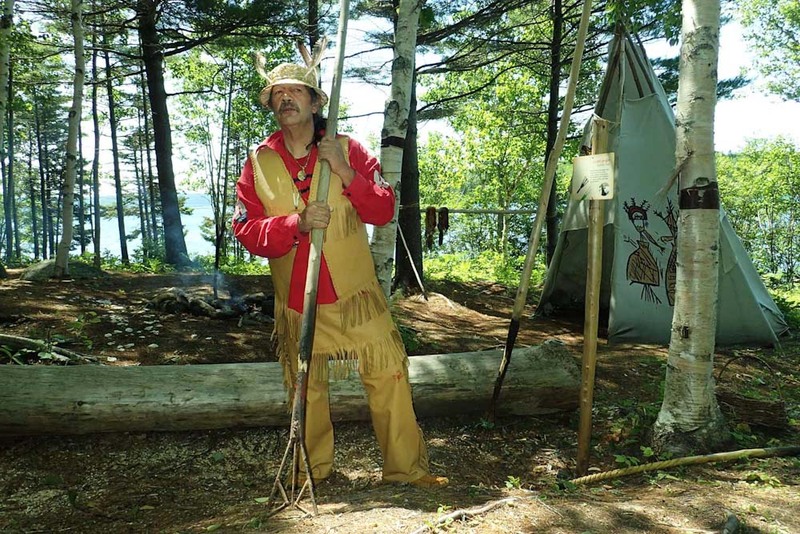 Walk the island’s lakeside trail and delve deep into the world of the Mi’kmaq Nation. By Nikki Bayley. Dressed in fringed caribou skin regalia that she made herself, using dried caribou veins as thread, Giselle Stevens walks out of the forest to welcome us to Goat Island. Tucked away on the shores of the Bras d’Or Lakes in the heart of Cape Breton, Nova Scotia, Eskasoni is the largest Mi’kmaq community in the world. 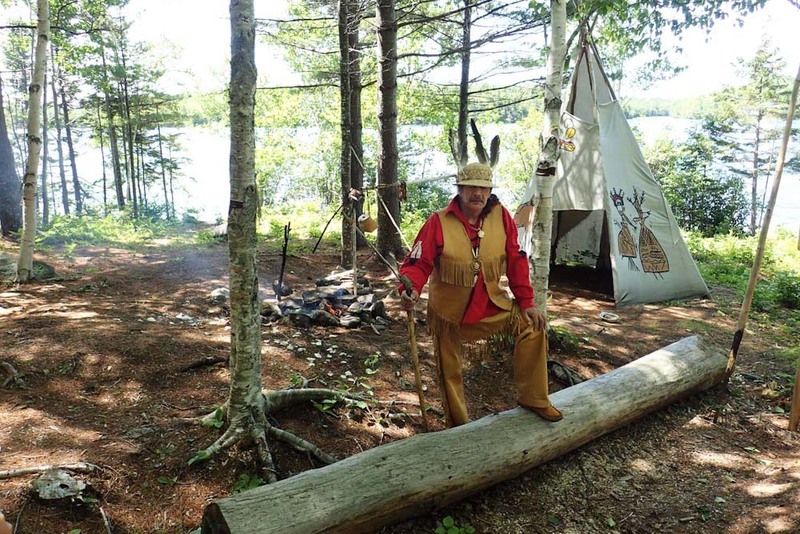 The Goat Island project allows visitors a rare chance to immerse themselves in Mi’kmaq culture by way of a 2.5-kilometre nature trail around the island’s shoreline through the leafy forest, punctuated by encounters with interpretive guides along the way. Falling into step with Giselle as we walk the sun-dappled trail, we see a teepee in the distance under the shade of a tree where Lindsey Paul is waiting to talk to us about the nation’s traditional hunting practices and the medicinal plants and flowers that were used in the community. Also wearing caribou skin regalia, topped with a hat decorated with eagle feathers, Lindsey explains how the Mi’kmaq would sharpen their spears by heating them in the fire, and how the soft mud of Cape Breton hides a wealth of tasty eels. Between the brutal cold of the Cape Breton winters and the hardships that all First Nations endured after European contact, the Mi’kmaq have learned to become a resilient people. “Everything and everyone has a purpose,” nods Lindsey, “From kids gathering wood for the fire to using flowers and trees for medicine. The Golden Thread that grows here is full of vitamin C and good for sore throats and colds. It’s a belief that’s echoed by Tracy Menge, Director of Community Economic Development for Eskasoni First Nation, who explains that “an eagle feather is the ultimate gift from a Mi’kmaq person. The community of Eskasoni are working hard to keep their language alive. Language projects include the first Mi’kmaq immersion school for children to record the stories of elders for future generations. “We don’t want to lose our language and traditions,” explains Tracy Menge. In its fifth year, the island is now welcoming some 7500 visitors annually. Back on the trail things take a spiritual turn when we meet Kenny Stevens for a smudging ceremony. Phones and cameras are put away as Kenny explains in his soft voice the significance of this spiritual purification ritual which involves burning of sweet-smelling medicinal herbs and grasses, and fanning the smoke over your limbs and face. It’s a short ceremony but a moving one, and as a group it’s clear we feel the honour of sharing in one of the most important First Nations traditions. Lighter in spirit it’s time for our final stop with Germaine Doucette and Micheal R.
Denny who share one of the community’s traditional songs and then have us up on our feet learning to dance a ko’jua. We giggle as we dance, stomping our feet, hopping, and swinging our arms in time to the hypnotic drum beats. As we move, faint traces of the scent of the sweet grass and sage that was burned in our smudging ceremony follow us, and our laughter echoes out across the lake and trees. Giselle walks us back to the Information Centre to show us how to weave dried sweet grass into decorative bookmarks over slices of fresh-made bannock bread spread thickly with treacly dark molasses. As we walk, we talk about modern pow wow music and the band Tribe Called Red. Giselle grins and fishes out her iPhone from a pocket in her traditional regalia and delightedly plays a few seconds of their biggest hit, Electric Pow Wow. “I love these guys!” she beams, as she shakes her head to the beat, caribou fringes dancing – the perfect representation of Goat Island, keeping a traditional culture alive, but with both feet firmly set in the present. To take the guided tour on Goat Island visit Eskasoni Cultural Journeys. Check out the Celtic Colours International Festival (in October) and don’t forget to watch out for the sunset on the Cape Breton skyline.